my hands have been my most important tool for as long as i can remember. amanda kapousouz lives in athens, ga with her husband and two children. she is a fiddler, knitter, seamstress, bow repairer, teacher, and mother. many creative pursuits have manifested into some pretty exciting careers! from professionally busking in the heart of new york city's subway system to teaching children on films, tv, and even a circus tour, she is always drawn to 'off the beaten path' work. amanda relocated from nyc to athens, ga to spend a few years performing, recording, and touring as 'tin cup prophette'. over the last few years, however, she has had children and has rekindled her love for fiber and textiles. drawn to the idea of connection, amanda seeks work that embodies this concept. 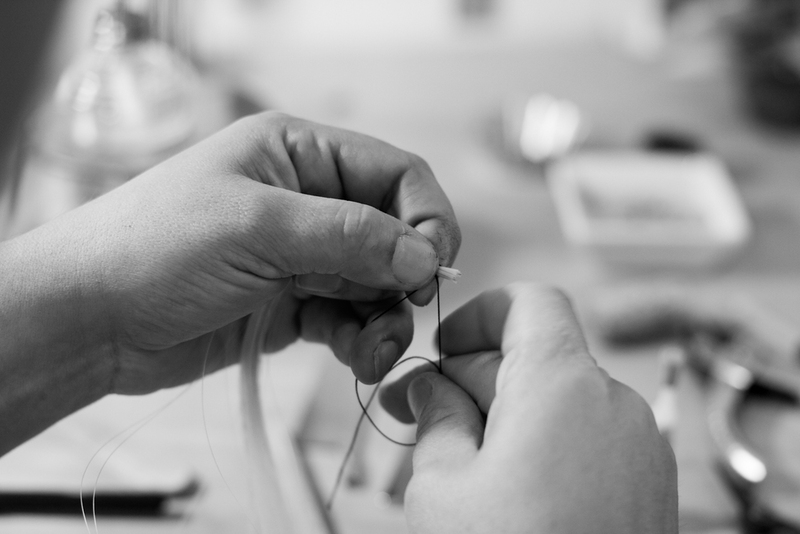 from the individual (and literal) connection of stitch to stitch in knitting to the more abstract connection presented in her bow work, she loves discovering relationships. the bow work has provided a connection to all of her favorite things: music, art, science, math, history, and her appreciation for meticulous and precise hand work.